In our latest feature on outdoor learning, Education Today hears from The Country Trust, a leading national education charity, on its ambitious plans to provide even more support to schools in disadvantaged areas and enable children to learn directly about food and farming. “What’s this Miss?” asked one of the children. “It’s a strawberry” replied the teacher, “Have you ever tried one?”. “No!” came the child’s reply. For many children unfamiliar with the look and taste of everyday fruit and vegetables this reaction is not unusual, particularly for those from inner city and urban schools, but increasingly suburban and even rural children too. Last year a survey by Leaf (Linking Environment and Farming) showed that significant numbers of children aged 5-11 did not know how many of our staple foods are produced or how fruit and vegetables are grown. Six in ten children did not know lettuce grew on the ground, while nearly eight in ten (78%) did not know broccoli grew on a plant. Many children from disadvantaged backgrounds may rarely get the opportunity to go beyond their immediate neighbourhood let alone visit a working farm. 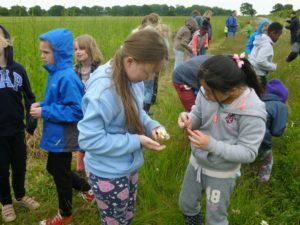 The Country Trust is dedicated to bringing alive the working countryside for those children least able to access it, and provides transformative countryside educational experiences that can have long lasting impact. Founded nearly 40 years ago, the charity focuses on children in primary schools in some of the most disadvantaged areas in England and Wales, as well as children with Special Educational Needs and Disability. Last year the charity helped over 24,000 children to understand and experience the working countryside through Farm Discovery day visits, Countryside Discovery Residential visits, yearlong Food Discovery programmes as well as through workshops in schools and at agricultural shows. The Country Trust has ambitions to work with even more schools over the next 3 years. Sharon Roberts, a qualified primary school teacher, is one of The Country Trust’s new Farm Visit Co-ordinators and responsible for visits across Essex and Kent. “The primary national curriculum now requires children to know where and how their food is produced” she says “The Country Trust make it easy and safe for children to visit farms and for farmers to share their knowledge and passion”. Sharon recently organised a farm visit for Year 3 children from Woolmore Primary School in Tower Hamlets, east London, to Tiptree Farm in Essex. The farm grows fruit for the famous Wilkins & Sons Tiptree jam and they were eager to get involved with The Country Trust as part of a wider programme of community engagement. The visit was carefully designed to be both informative and fun and included a tour of the farm on a purpose built 40 seat tractor trailer. The Country Trust specialises in visits to real working farms where children can learn first-hand from those who produce our food. 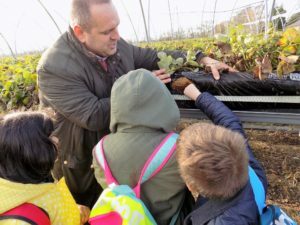 At Tiptree Farm, the Farm Manager and his Commercial Manager were on hand, explaining all about the different fruit grown and the farming methods used while the children were able to get up close with strawberries and raspberries before they were harvested. They were also able to spend time learning about the history of the farm in the on-site farm museum, and, as a final treat, they were given time to explore the farm’s purpose built strawberry-shaped maze. 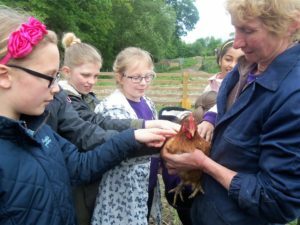 This was the first time The Country Trust had worked with Wilkins & Sons to host a farm visit and both farm and charity worked closely to ensure the children got the most from their experiences. “The farm is amazing!” said Sharon, “They have 45 different varieties of fruit and the visit ties in with the children’s topic of learning where food comes from”. Gillian Drinkwater, Senior Teacher and Curriculum Lead at Woolmore Primary School agrees “We know how important it is to give children the opportunity to learn in different contexts and, in particular, different landscapes. 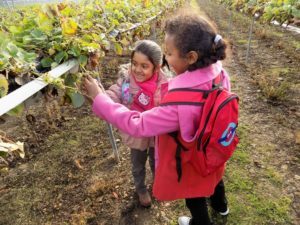 Our farm visit taught children about the natural environment as well as enabled them to identify and name different types of food grown at the farm. It’s a great context in which children can experience and learn – learning that really ‘sticks’!”. Gillian and Woolmore School are also regular participants in The Country Trust’s Countryside Discovery Residential programme. These trips enable children to have a longer, more immersive experience in the countryside, finding out more about food, faming and the countryside, as well learning how to take responsibility for themselves. For many this will be their first trip away from home and their first trip outside of London. Over three or four days, they explore working farms, forests and wildlife reserves, they visit the seaside and have the chance to get up close to animals. Based at residential centres in the East Anglian countryside, the children learn to live well and eat well together, learning and playing outside. All the activities are arranged by The Country Trust. Gillian believes the benefits to the children are enormous, from social and educational benefits, to enhancing health and well-being – the children are often learning without knowing it. “As with most inner city schools, Woolmore Primary School has a wide mix of nationalities with many cultural and religious differences. Taking the children out of their immediate surroundings and giving them different experiences, including teaching them about where food comes from can have a lasting and profound effect that will stay with them forever”. In addition to the farm and residential visits, The Country Trust offers a ground breaking Food Discovery programme which has now run in over 30 urban schools across England. The charity’s aim with the programme is to bring food, farming and the countryside together in a whole year of hands on discovery. 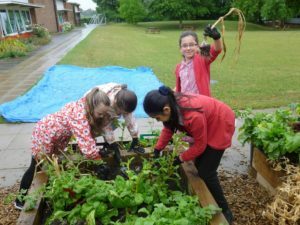 All the children take part in every activity, from cooking, growing and harvesting food, to organising and running a playground market, and preparing and sharing a harvest feast. Local farmers welcome children onto their farms to share experiences of food production at a commercial scale, and are often invited to visit the schools, along with local food heroes, to give presentations and share their passion for food and farming. Sally Hetherington Aherne, Food Discovery Co-ordinator at The Country Trust sees first-hand how young children’s confidence around food quickly grows during one of her year-long programmes. “All the children have learnt something new about the food they have seen and grown” she says “which they have been able to share with their families. 69% have gone on to cook recipes at home and most children feel confident that they could grow their own food plants too. They are so proud of what they have achieved, and love to use the new vocabulary they have learned whilst gardening and cooking, and visiting our amazing farmer hosts’. Over the years The Country Trust has built up a dedicated network of farm hosts and estate owners who provide unique visits, either as day trips, as part of residential visits or the food discovery programme. Financial poverty often goes hand in hand with poverty of experience, and as well as the obvious educational value of the visits, children build a rich bank of experiences that fuel their imagination, build their self-confidence, raise their aspirations and enhance their vocabulary. The Country Trust raises funds to ensure that farm visits are offered at no charge to schools with a higher than average percentage of children eligible for Free School Meals (and therefore Pupil Premium). The only costs incurred are for transport. Funds are also raised to enable schools to experience a year of Food Discovery and to offer a subsidy to qualifying schools for residential visits. The more support the charity is able to attract, the more children it can provide for. The Country Trust believes that by sharing knowledge, igniting curiosity and broadening horizons we can help teachers to equip children with the life skills and knowledge to make more informed choices about food which will improve their well-being. Learning outside the classroom with the Country Trust provides fantastic opportunities for hands on learning, building new relationships with those who nurture the land to produce our food and unforgettable moments when children (and teachers!) can experience patience, awe, wonder and success.